This novel is a riotous compote of phonology, Helsinki, wild wolves, murder and an abandoned wife and dog. Once again, I must confess, without being given this book to review, I undoubtedly would not have read it. How grateful am I that Bookman decided to send it to me. It’s so unlike anything else I’ve read recently, and it’s terrific. The cover is a jean pocket with a wolf with its tongue protruding - modernity meats the beast. 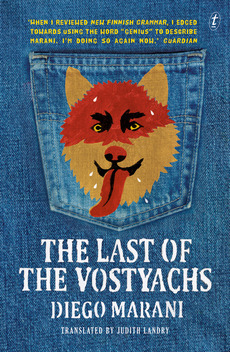 The title is ‘The Last of the Vostyachs’ and the protagonist, or hero is exactly that. His name is Ivan and he is the last man left speaking a specific and obscure northern Samoyedic language which even the wild wolves seem to understand. It begins in a Russian Gulag where as a young boy, Ivan has just witnessed his father’s death and from that moment on, he does not speak again until he is released from the Gulag. He’s then discovered by Ola who is a linguistic specialist in northern Samoyedic languages and she can’t believe her good fortune to have stumbled upon Ivan, the last of the Vostyachs. Ola is Russian and she has a Finnish colleague, Professor Aurtova in Helsinki. (They first met at a seminar on “Cacuminal fricatives in Proto-Uralic”.) He used to be her mentor, and she shares the thrilling news of this new discovery with him – unfortunately, it contradicts all the work he’s been doing on the origins of the Finnish language for the last however many years and he’s about to present a paper to the XX11st Congress of Fino-Ugric languages. I was glad that I’d done one introductory linguistics paper when I was completing my BA late in life – it stopped me being completely thrown when all the phonology terminology began to infiltrate the story – the words are delightful though even if you’ve never heard of them – the author is having a wonderful time, both serious and hilarious. This newly discovered Vostyach uses the lateral affricative with labiovelar overlay when he speaks. “It is the labials, the palatals and the sibilants which distinguish us from beasts.” The concern for the Professor Aurtova is that the discovery by Ola of this lost language connects humans more closely to the animal world. He’s having none of that! I lived in Norway briefly in the 70’s and hitch-hiked around Finland and up in Lapland and close to the Russian border. The thing is, the Finns don’t really see themselves as Scandinavian and they also live in the shadow of Russia, and their language is indecipherable to the other three, Denmark, Norway and Sweden (who, it can be argued by some linguists, speak a dialect of each other....oh, I won’t go into that... you see I only did 101 Linguistics and I’m on thin ice). As for thin ice, there is plenty of that in this highly original read. There’s a mangy old dog, there are wild wolves, a Siberian tiger and a whole host of animals at large in Helskini. Honestly, you really should just read it. “I edged towards using the word ‘Genius’ to describe Marani. I’m doing so again now”. It’s a real page turner and similar to many Scandinavian novels, there’s the gritty dark underbelly, with bodies in the snow, but the triumph is indeed, the man himself, Ivan, the last of the Vostyachs and where he ends up, which is hilarious and unexpectedly delightful. And too, the delicious detail that the book is written by an Italian and translated into English, and the key theme is the origin of the Finnish language. It’s a celebration of language in so many ways. Maggie Rainey-Smith is a Wellington writer and regular reviewer on Beattie's Book Blog. She is also Chair of the Wellington branch of the NZ Society of Authors.